It doesn't happen very often lately, but one afternoon this summer (while taking a well deserved personal day from work), I was home alone and free to do what ever I wanted. That consisted of a little cleaning, I lot of the job hunting and watching a few cooking shows that I normally don't see because they are on during the day. One of the shows that I had the pleasure of watching was Giadi at Home. 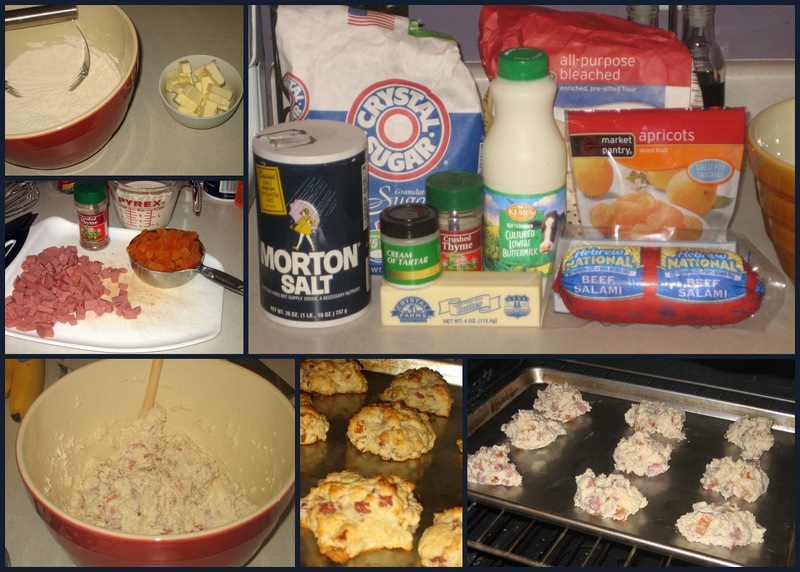 She talked of baking these apricot & salami scones for a friend's son's bake sale at school. Honestly, I found the thought of mixing apricots, salami and dough together quite off-putting, but the idea stuck with me for a while. Finally, when trying to figure out what to make for a pot luck baby shower where the mom to be didn't have a sweet tooth, I just had to check it out. And man, am I glad I did. I was so wrong on the off-putting thing. The sweet and salty combo is perfect for in the morning with coffee or for an afternoon treat or as it turns out, a baby shower. The dough is soft on the inside, but has a wonderful crunch on the outside...even though they're not small, it's hard to have just one. Preheat oven to 400 degrees. Spread some butter on two baking/cookie sheet pans and set aside. Take stick of butter and chop finely into little pieces. Place all pieces in a small bowl and put in fridge to keep chilled until you need them. Chop both dried apricots and salami and set aside until the batter is ready. Mix the flour, sugar, baking powder, salt, cream of tartar, baking soda and thyme in a large mixing bowl and whisk together. Using a pastry blender or a fork, incorporate all of the butter into the flour mixture. Depending on the day, the mixture could be too dry and you may need to add up to another 1/4 cup butter. If this is the case, slowly add a little bits of chopped up butter to the mix, small portions at a time until everything is incorporated together and there is no dry mixture at the bottom of the bowl. Using a large mixing spoon, add the apricots and salami to the flour/butter mixture until they are evenly spread throughout the mix. Then add the buttermilk and stir with same spoon until the dry mix is saturated. Using a 1/3 measuring cup, scoop the mix onto the pre-greased baking sheets with approx 2 inches between each scone. Bake one pan at a time for 16-18 minutes, or until the tops start to brown slightly. When the scones come out of the oven, let them sit on the pan for about 5 minutes, then transfer to a wire rack to cool. Approximately 20 minutes. Serve with apricot jam or butter. Enjoy anytime!! !